Are you looking for a book for a young girl in your life? Something that is going to uplift her and inspire her to be a leader in a world of possibilities? We are sharing a picture book that will do just that. 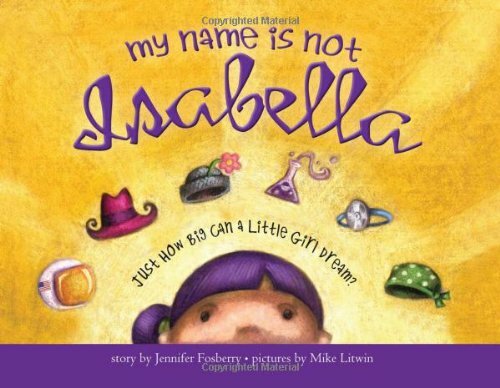 One of our favorite stories is My Name Is NOT Isabella by Jennifer Forsberry. It is such a fun and inspiring picture book for girls and kids everywhere! My Name is Not Isabella by Jennifer Fosberry illustrated by Mike Litwin is a picture book about a little girl named Isabella, but as she goes through her day, she pretends she is a bunch of different and amazing women throughout history. This book is about a mother and a little girl named Isabella. Every time the little girl talks to her mother she tells her that her name is not Isabella, she takes on the names of iconic women from history. Like Sally Ride, Annie Oakley, Rosa Parks, Marie Curie, Elizabeth Blackwell, and even Mommy. We both love that in the back of the book there are little blurbs about each amazing woman and a list of places we can find more information. This book is an entertaining and inspirational book, and educational as well. The message of this book is fantastic. Filling a growing child’s mind with excellent role models. The illustrations are colorful and inviting. You will enjoy looking through all the fun artwork and get a kick out of how the little girl goes through her day with such an understanding mom. This book is also such a great introduction to more significant and more profound topics.